The UNC Department of Anesthesiology offers many educational opportunities in a variety of formats. 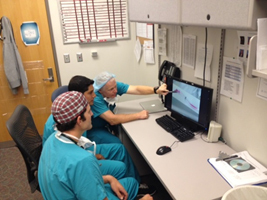 Fellows will have a comprehensive educational curriculum through hands-on experience, lectures, conferences, self-learning, simulation, problem-based learning discussions and journal clubs. Fellows will participate in and lead discussions. The obstetric anesthesia faculty member assigned to labor and delivery will be present to help facilitate the daily discussion. Fellows are expected to attend these learning sessions. 1) Daily Informal Teaching: Daily teaching of the residents rotating on obstetric anesthesia is a priority. Each rotation will have two residents on the OB Anesthesia service. Typically one resident is doing his/her second rotation, while the other resident is new to obstetric anesthesia. Residents have been given reading assignments to complement the lecture schedule. Lectures will initially be given by the attending assigned to labor and delivery for the day. As the year progresses, the fellow will contribute, giving each lecture at least once during the year. 2) Fellow Specific Lecture Series: A fellow level lecture series has been developed to cover core topics that may not be addressed during the resident lectures. Lectures will be given by one of the core OB anesthesia faculty. 3) Society of Obstetric Anesthesia and Perinatology (SOAP) Webinar Series: SOAP has developed a webinar series designed exclusively for obstetric anesthesia fellows. These conferences give fellows a chance to convene and hear lectures from international experts in the field of obstetric anesthesia. Fellows will have protected time during these webinars to ensure participation. These webinars can be accessed on a departmentally issued iPad. Webinars should be used to facilitate discussion between the fellow and the faculty member covering labor and delivery. 4) Problem-based learning Discussions (PBLDs) – Obstetric Anesthesia problem-based learning discussions are held monthly with the attending and fellow, as well as the residents rotating on obstetric anesthesia. They are in case-based format and center around difficult clinical scenarios as well as recent publications. 5) Journal Clubs: UNC sponsors approximately 10 journal clubs per year. These sessions are generally held in the evening and are conducted by visiting professors from around the country. During the obstetric anesthesia educational block, the journal club topic will be specific to obstetric anesthesia. 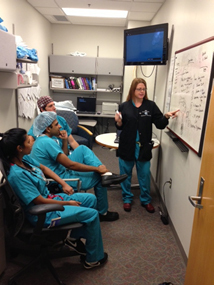 In addition, combined UNC-Duke obstetric anesthesia journal clubs will be held biannually. Anesthesiology Departmental Grand Rounds/Morbidity and Mortality Conference is held on Wednesday mornings from 7:00am-8:00am. Attendance is mandatory. OB-GYN Departmental Conferences: When clinical obligations permit, fellows will attend relevant OB-GYN Departmental Grand Rounds and Morbidity and Mortality conferences on Wednesday afternoons from 1:30pm-3:30pm. All fellows have ready access to intradepartmental, campus-wide and Internet computer facilities to assist with literature searches, research activities, lecture presentations, and self-paced programmed education. The obstetric anesthesia office is equipped with multiple computers and ample desk space. The internal website contains rotation goals and objectives, educational material, pertinent journal articles and clinical guidelines. Computer facilities are available 24 hours a day to allow fellows free access to the latest methods of education in anesthesia. The department has a staff of computer specialists with expertise in educational software, word processing, data storage and retrieval, statistical analysis, and multimedia presentation techniques. Fellows are encouraged to utilize these facilities to assist in research endeavors and to supplement the more traditional didactic and clinically based educational experiences. The department has collaborated with the UNC Health Sciences Library to develop the Sugioka Library and Educational Resource Center. The “electronic” library provides access to all major English language Anesthesiology, Critical Care and Pain Medicine journals and electronic textbooks. Links from this page and others from our website allows access to multiple educational resources including PubMed, Cochrane Library, MD consult and Up To Date. Our physical Anesthesia Library maintains a set of core text books, multiple computer stations and comfortable reading areas. The Health Sciences Library is located in close proximity to the UNC hospitals complex. Electronic journals and books and databases such as PubMed, CINAHL, ISI Citation Databases, BIOSIS, PsychINFO, eFacts, and Lexi-Comp are available anywhere on campus. Faculty, staff, and students can access almost all electronic resources from home.